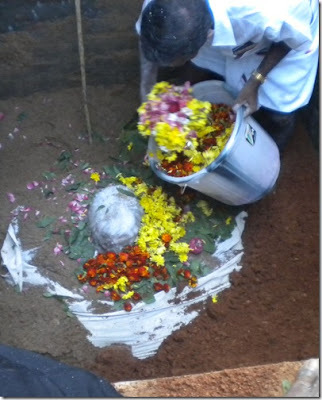 Richard Clarke, a spiritual seeker, ex-patriot living in India, and a dear friend of The Daily Undertaker, has graciously shared his experiences with us twice before, in the preparation of an Indian village funeral car, and more recently, sharing the story of a friend's cremation and all the wonderful rites that accompanied it in 'Sarasvati's Ashes'. Nothing has prepared me, however, for the wonder I experienced in reading his account of a Western Holy Man's interment, and the many moving rituals that were performed in memory of this man, A. Ramana, formerly known as Mr. Dee W. Trammell. What is most moving to me in the story and photographs, is the reverence, care, and love shown to this man's remains and the participation of friends and loved ones in rituals that are at once completely new to me, and yet, universally understandable and resonant. Richard's posts on the rituals surrounding this man's passing reminds me of what is important in funerals, and why I continue my work as an undertaker. I encourage my readers to visit the original posts, The Interment of A. Ramana into his Samadhi, and The Shadra of A. Ramana in Tiruvannamalai for many more incredible photos and a more complete explanation of these rituals. 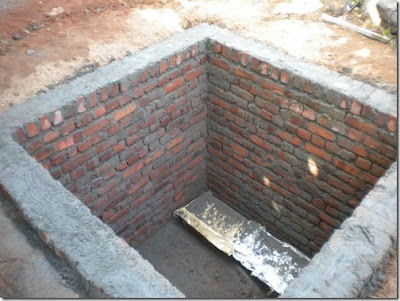 Although most people are cremated in India, revered spiritual masters such as A. Ramana are buried in an position of meditation inside a brick lined vault. The bodies of such masters are considered to be temples, and after burial, temples are indeed built on top of their graves. Apparently, only four people of Western origins have been honored in this way in the Tiruvannamalai area. After having sat in state, as shown in photo at the beginning of this post, A. Ramana, is placed on a platform, and is anointed with a series of meaningful substances including rosewater, milk, honey, turmeric, sandalwood and ash. 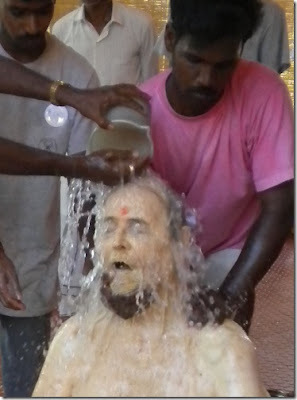 After each substance is poured over him, he is ritually washed with water. Ritual washing is an important practice in Hebrew, Moslem, and Christian traditions as well. In early American times, neighbors and relatives performed this ritual. Today, for many Americans, Funeral Directors perform this task, along with embalming. Whether it takes on a religious significance or not, as a funeral director, I see it as a final act of caring for the dead. We all die. Why not take the time to bathe the dead before they are laid to rest? Following this, he is dried and dressed in white cloths, placed in a large fabric bag, and lowered along with the platform, by ropes into the grave. Throughout the whole process, there is a great deal of chanting, incense burning, as well as participation and observation by a large group of friends and associates. 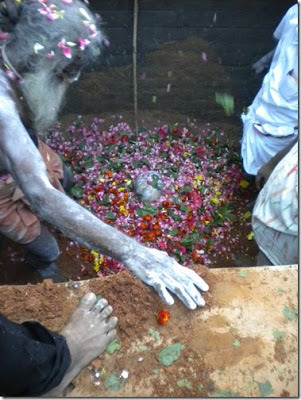 The bag in which A. Ramana was placed, as well as the brick lined vault, are filled, layer by layer with holy leaves, flowers, sand, camphor and ash. Inch by inch this grave is filled with these layers of substances intended to preserve the body and express reverence and tender feelings. Throughout the process his head and body are re-adjusted to remain in the proper position. At this point, his head is nearly covered, and a long piece of bamboo is used to keep track of where his head is, as it is believed that the spiritual energy of A. Ramana will flow out from his head. This is vitally important to the future construction of the temple above the vault. In India there are two main death ceremonies, one done on the day of the death or the day after, and then a Shradha, a ceremony where food is offered, usually occurring 10 – 14 days after the death. I suspect that one reason for this ceremony is so people who were unable to come immediately after the passing of the body are able to come and join the rites. The Shradha consists of an elaborate pooja, with people close to the deceased playing key parts in the pooja, and then a food offering. If the Shradha is held for a villager, the food offering would be to the crows (symbolizing the spirits of ancestors). 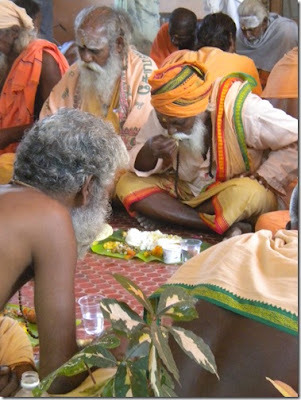 For a holy man, the food is usually offered to sadhus. 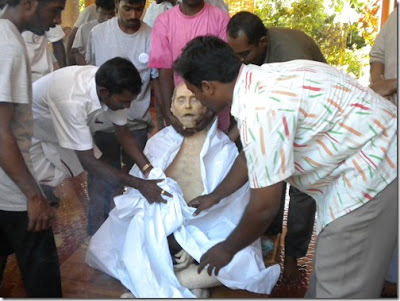 This is what was done for A. Ramana. In a Shradha for a villager, the key role would be played by the person’s son. With A. Ramana, this role was played by two key people in his life in India: Jan, who runs the Tiruvannamalai AHAM ashram, and Vivian, A. Ramana’s personal attendant for the last several years. Friends and associates gather prior to the shradha. Similar to the anointment and washing of A. Raman's remains, the lingam is anointed with a series of substances and washed with water after each one. 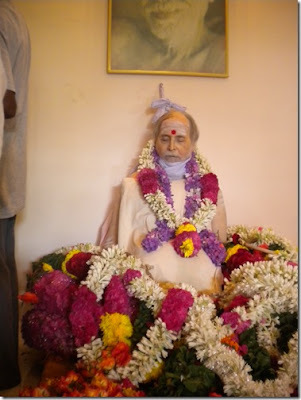 Those closest to A. Ramana are physically involved in each step. 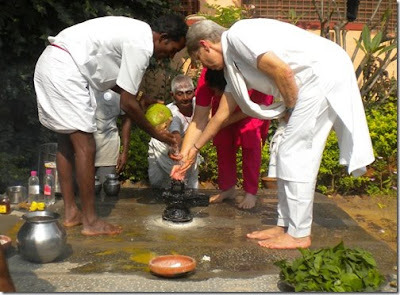 The milk, turmeric, fruit, rosewater, ash, honey, etc., and water flow through their hands and then onto the lingam, which is positioned directly above A. Ramana's head. 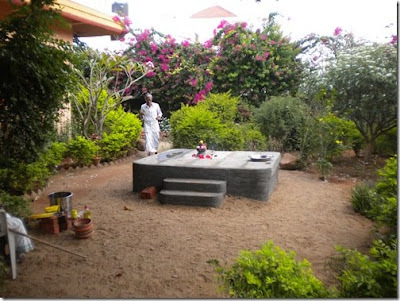 Next, and incredible series of flower wreaths, photos and fruit are placed around the lingam. 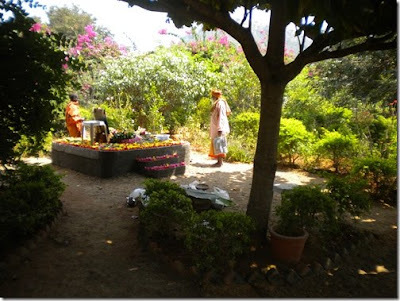 After the shradha, comes the food offering. I can't look at this photo without remembering some of the countless funeral lunches I have attended. In my community, the meal is mostly about fellowship and sharing stories. 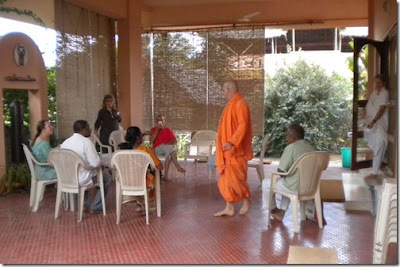 In this part of the world the emphasis is providing hospitality to others and gaining their blessings. 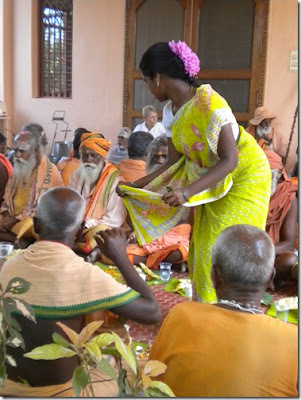 In addition to the meal, these holy men are honored with flowers, and given clothing and money on behalf of the deceased. Following the food offering, those attending the ceremonies go their separate ways, but first, many stop to pay their respects once more. Finally, from Richard's post, here are a few words written on the occasion of A. Ramana's death by someone close to him. I think that they speak beautifully about not just the phenomenon of death, but about our connection as humans to one another. No matter what our culture, our traditions or our spiritual perspective, in our humanity and caring for each other, we are all the same. Wonderful and incredibly beautiful. Thank you. Thank you, and thanks again to Richard Clarke for sharing this with me. Diresinger, I'm so glad that you feel at home here. I have tried to create a thoughtful, accepting and positive environment here, and the comments and thoughts of readers do a lot to make it that way. I'm speechless.. that was so beautiful and an amazing way to honour someone. Very interesting, I'm in no rush to leave, but if my remains were treated half as well as that I'd be happy to know.